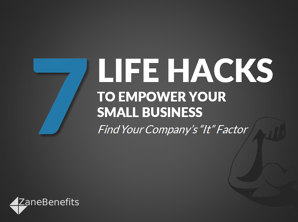 Zane Benefits, the leader in individual health insurance reimbursement for small businesses, announced today the publication of a new eBook, "7 Life Hacks To Empower Your Business." The guide provides seven life hacks to empower small businesses and help them find their "it" factor. According to Zane Benefits, small business owners know that running a small business is a lot of work, yet it’s extremely rewarding. And there is no reason running a business should not be second nature to small business owners. The best way to achieve this is by obtaining invaluable knowledge, also known as life hacks. The new guide provides small business owners, managers, and CEOs with seven valuable life hacks to help them find their company’s “it” factor that will become the foundation of a successful business.